Children have birthdays every year and their interests change even faster than that. As they grow up and their view of the world changes their passions evolve. It is up to a parent to nurture these passions and help guide their kids along the right track. Now parents all have different views of what the right track is for their growing kids, but one thing persists among them all, a birthday cake. 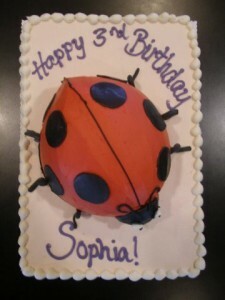 Depending on how intricate the details of the birthday party are, and how big it is, a parent’s focus on the design of the cake may be a lot or a little. It all depends on time. A parent can do one of a couple of things for a cake, run to the super market and pick one up last minute, call ahead to have a name pasted on a boilerplate cake, order a custom cake through a local bakery, or bake one themselves. Every mother has a recipe book and a favorite standby for baking birthday cakes. But what about design? 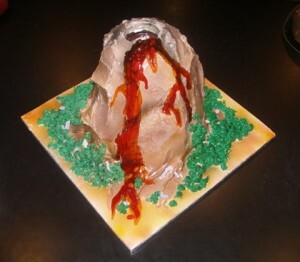 How can we make a kids birthday cake specialized, customized and reflect what they are passionate about. My son loves firetrucks ever since we were at a labor day parade in our hometown of Lafayette, Colorado. The firetrucks rolled down the street with their sirens blaring and he was enthralled, that was when he was 1 year old. 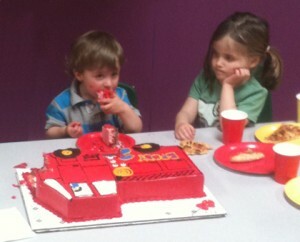 When he was 2, he wanted a firetruck cake and when he was 3 he wanted a bulldozer cake. 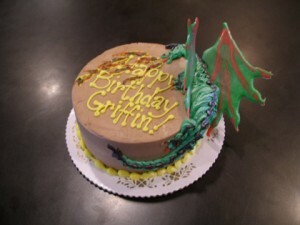 We ordered a custom birthday cake from the local pros Indulge Bakery for his 2nd birthday. For his 3rd birthday I decided to design my own. What I did was get a giant blank birthday cake from Costco and bought a whole bunch of colored frosting. I printed out a photo of a bulldozer and eyeballed the design, it turned out pretty good and was eagerly accepted by all the kids. Another great idea is to send your local bakery a photo and have them do their magic and print it on the cake with some sort of machine. I still have no idea how that works, but it looks good. This is the most precise way to personalize a cake. What about shapes? For my son’s first birthday my wife purchased a series of train shaped baking pans. Each pan was a train car and had an engine and caboose. I stayed up way too late customizing the blank cakes with intricate frosting. I do not recommend this unless you have an entire half a day to devote to frosting. There are many shapes you can make, but a specialized pan is needed. We are unlimited with imagination, but limited by what shaped pans we can find to buy. The best way to customize a birthday cake if you want a shape and cannot find the appropriate mold is to make a basic round cake and pile up cake mass and lots of frosting on the top. Here are some examples from Indulge Bakery of how to build up the shape of a cake. In the end after everything is done, your child will love his birthday cake no matter what, as long as they get to blow out the candles and get the first slice! Rich Coffman is a writer on the front range of Colorado.